In the good old days, many of us had a Grandfather or Uncle with a farm and we used to go and visit them whenever we wanted to escape the hustle and bustle of city life, when we wanted to get in contact with nature. But times have changed. Many people have moved to the cities and have almost no contact with nature. They have nowhere to go and game reserves are too costly to afford. We are offering you a Grandfather or Uncle with a farm, just like in the olden days. You can go and visit as much as you'd like, and make yourself right at home. Best of all, you can offer your children the opportunity to experience life on a farm firsthand. At night you can see the night sky with its millions of stars without any air- or light pollution! It is breathtaking, almost unbelievable! Don't hesitate. 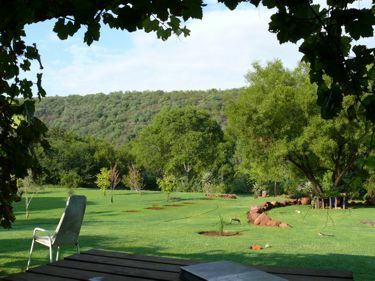 Pick up your phone and dial any of these farms for the outing of your life! 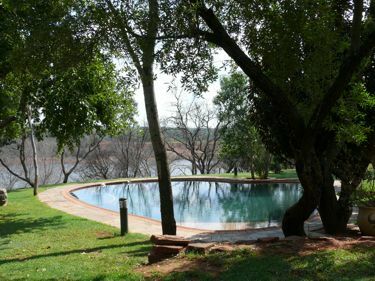 Six kilometres from Groot Marico, nestled in a deep valley, is the tranquil River Still guest farm and through its heart flows the untainted waters of the Groot Marico river. 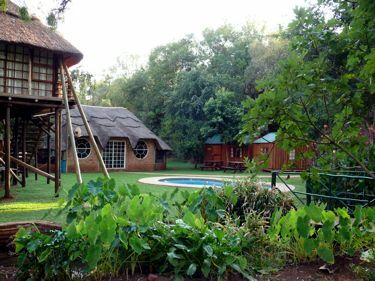 There are four rustic guest houses scattered on the farm with privacy and leisure in mind. Here the accent is on tranquillity, solitude and reconnecting with nature. A symbiotic relationship exists between lush nature and organic citrus groves fed by an old canal. This is a true birders haven with over 360 species in the vicinity and more than a hundred spots on the farm. River Still co-hosts annual the Herman Charles Bosman Festival were locals and guests enjoy music, drama, good food and one another's company. 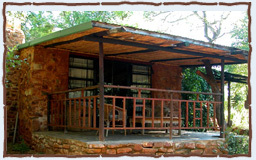 All accommodation is self-catered and all cottages are equipped with fireplaces and braai areas. 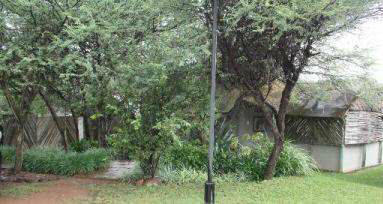 All houses have electricity, electrical geysers and gas stoves. Please supply your own towels and firewood. 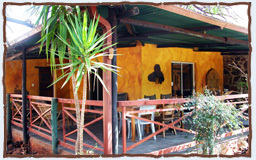 A lapa caters for bigger groups providing a central area to get together. This area has ablution as well as basic kitchen facilities available. All cottages are equipped with showers only. River Cottage is a two bedroomed cottage with a warm cosy atmosphere. All modern amenities are provided. 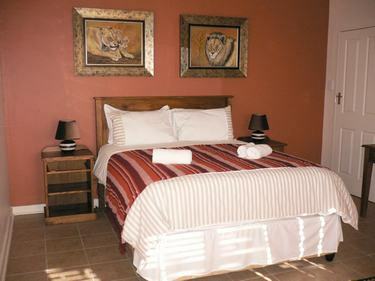 Fully equipped kitchen - refrigerator, 2 plate gas stove, microwave oven, kettle, and toaster. 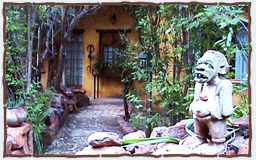 Caspir’s Kaya is an old stone and mud brick cottage, lovingly restored to retain the very specific character of the area. All modern amenities are provided. 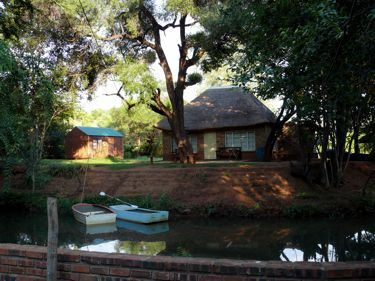 David's Cottage is a one bedroom cottage with reed ceilings creating and a warm and cosy atmosphere. All modern amenities are provided. 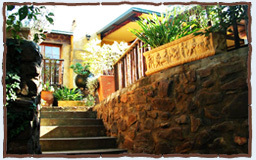 Accommodation is provided in an old stone and mud brick cottage, lovingly restored to retain the very specific character of the area. All modern amenities are provided.
" there is no other place that I know that is so heavy with atmosphere, so strangely and darkly impregnated with that stuff of life that bears the authentic stamp of South Africa". 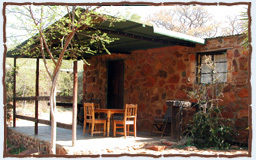 starlight evenings, amazing sunsets, game drives and just the relaxed atmosphere will make this an unforgettable stay. 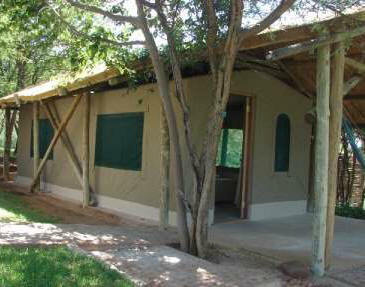 The camp is booked out for private groups only to ensure absolute privacy in the camp and the surrounding game farm. Self catering only. 50% Deposit with booking within 24 hours. 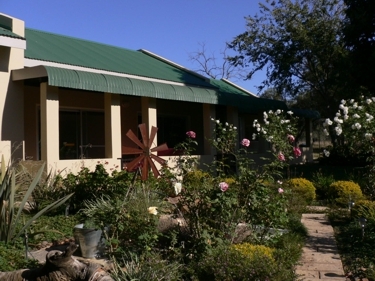 Situated on the farm Riekertsdam 16 km from Groot Marico in the North West Province. Route: Take the N4 to Rustenburg. Pass Rustenburg and Swartruggens. 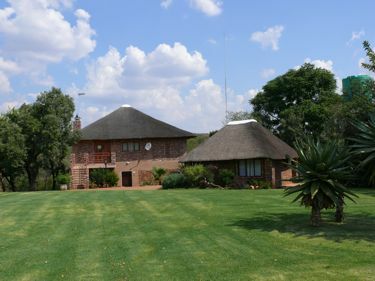 Drive towards Groot Marico. After the bridge on the Groot Marico River, turn North towards Skuindsdrif / Madikwe. 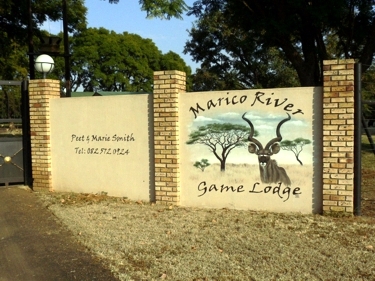 16 km further the Lodge is on your left, indicated by the Kudu painted on the gate wall. 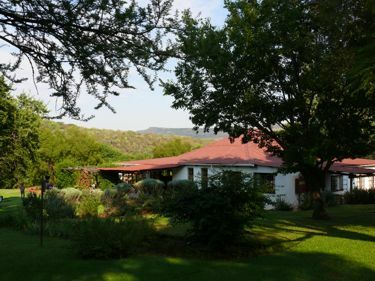 "Where Mountain and River meets ..."
Situated in a southern direction 5 km from Groot-Marico town on a well maintained dirt road. 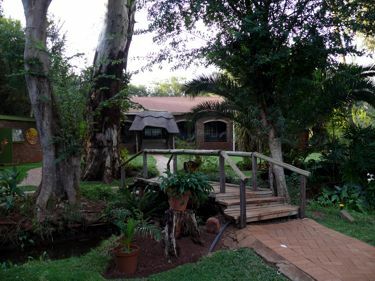 Nestled in a valley surrounded by mountains, this secluded chalet is situated on the banks of the mighty Groot-Marico river. Click on the Thumbnail photos below to see larger versions. Right-click on the photos above and select "Save as" to download high resolution versions of the photos. Besides listening to the sound of the water and birds, you can also do a bit of canoeing (provided), fishing, birdwatching. A walking trail is available for those who need a bit of excercise. One double bed, 2 single beds and a couch that can be converted to a double bed. 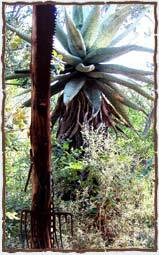 Amitaba is situated in a lovely secluded valley, 5 kms from Groot Marico. Stille Waters is ideally suited for bigger groups of up to 90 people as well as smaller families. 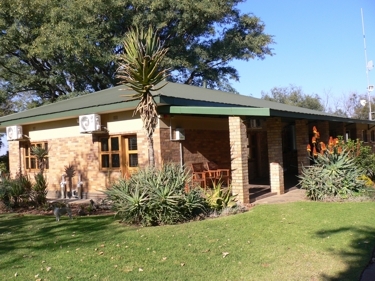 It is approximately 6 km to the south of Groot-Marico, situated in a lovely valley with bushveld surroundings. It can host large groups in several chalets, but small family groups will also feel welcome. 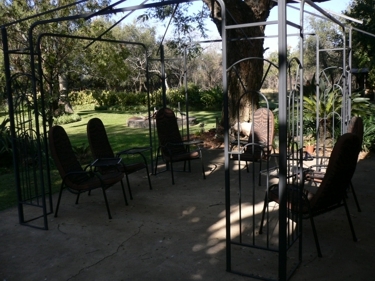 Special tarrifs can be arranged for bigger groups and children. Booking: requires 50% deposit to confirm. 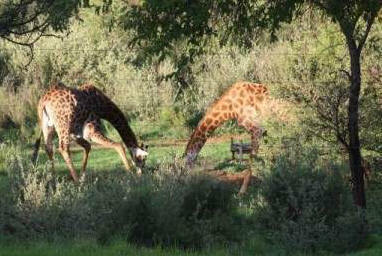 Tala Manzi is a beautiful game farm in the Groot-Marico. 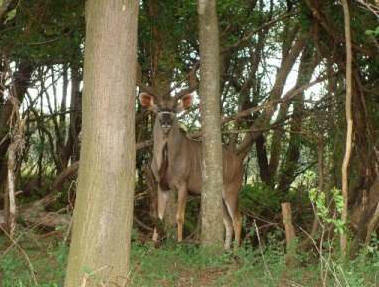 See four of the big five on this 3,150 ha. game farm as well as many other game species. 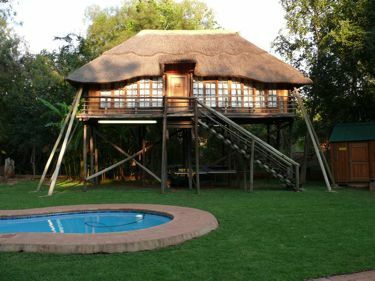 4 Luxury self-catering chalets with DSTv, air-conditioning and fully equiped for self catering. 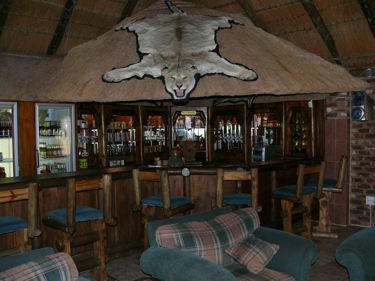 DSTV Big screen with bar facilities and veranda overlooking the waterhole with lots of animals. Contact the Information Centre for more information.